…what exactly is “25 feet” referenced to? We need a consistent starting point to compare flood and ground elevations. Enter the vertical datum. Surveyors, geodesists and insurers use the vertical datum as a surface of zero elevation to which heights can be referred to. TIDAL DATUMS reflect the interface between water and land and is defined by the tidal variation. For example, a tide gauge in the water measures mean sea level. Tidal datums are localized because the transition between types of datums can shift quickly. It’s also time dependent. GEODETIC DATUMS are reference surfaces of zero elevation to which heights are referred to over a large geographic extent. These datums are used to measure height (altitude) and depth (depression) above and below mean sea level. 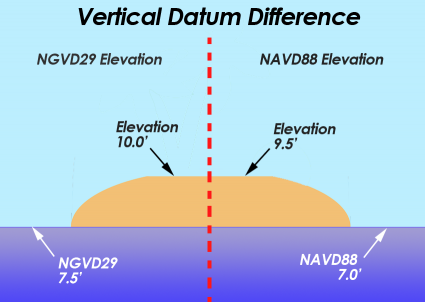 Commonly used vertical datums in North America are the National Geodetic Vertical Datum of 1929 (NGVD29) and the North American Vertical Datum of 1988 (NAVD88). A (vertical) geodetic datum often ties in tidal datums. A geodetic datum reference might use a tidal datum as a start point. If you think about it, a community’s height system should be consistent with a tidal datum because that’s where the water will flow. ORTHOMETRIC represents the height distance between the Earth surface and geoid at a specific point. Surveyors usually refer to orthometric heights. When you take the height at the peak of a mountain. It’s an orthometric height measured as a distance between the surface and the geoid. GEOID coincides with mean sea level as if you are imagining it as an extension under (or over) land areas. The geoid is an equipotential surface at which gravity is normal – closely approximating mean sea level. This is because of the varying densities that are present in the Earth at different places. There are gravity anomalies with undulations differing from place-to-place. Land and mountains prevent us from the seeing the geoid surface on the Earth. The Earth’s interior differs in density everywhere. This means that gravity varies everywhere on the Earth. This is why we measure gravity or the gravitational equipotential surface. We can then infer that this is how water would settle and model it mathematically. 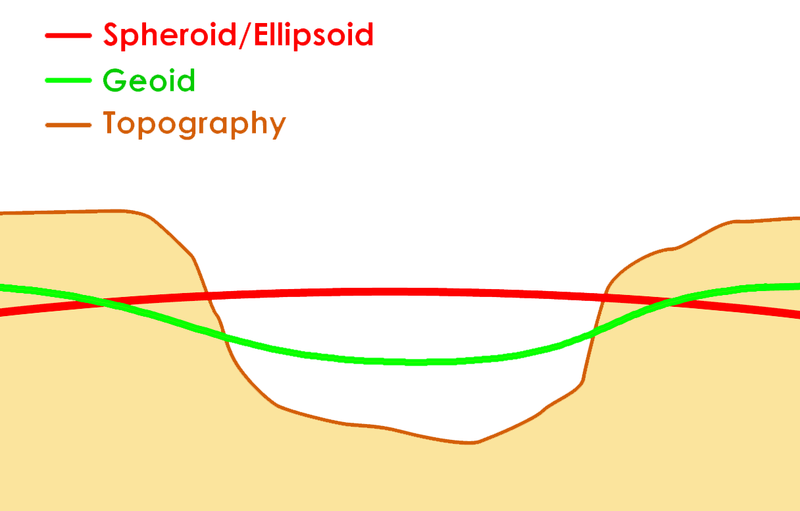 The geoid then gives a true zero surface for measuring elevations. 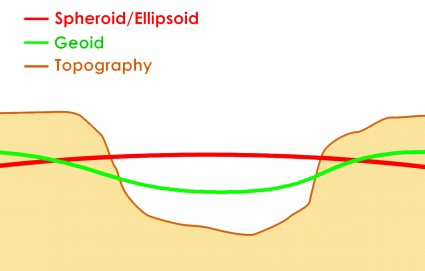 REFERENCE ELLIPSOID is the reference ellipsoid is a mathematical model of the shape of the Earth with the major axis along the equatorial radius. It approximates the geoid, but mostly coincides with geodetic network computations which point coordinates (latitude and longitude) are referred to. Commonly used vertical datums in North America are the National Geodetic Vertical Datum of 1929 (NGVD29) and the North American Vertical Datum of 1988 (NAVD88). The National Geodetic Vertical Datum of 1929 (NGVD29) (previously titled the Mean Sea Level Datum) was derived using 26 long-term tidal gauge stations and 1st order leveling stations constrained at mean sea level. These 26 tide gauges were set up in harbors along the east and west coast of the United States (and along the Gulf of Mexico. Twenty-one stations were in the United States and five in Canada. During a twenty year period beginning in 1877, a “level line” was surveyed across the entire United States. As the network of level lines across the country expanded, this became the basis for the vertical datum. 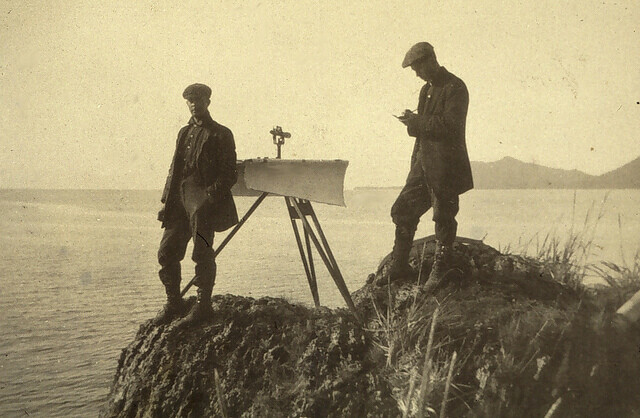 NGVD29 was the system used by surveyors, engineers and mapping for most of the 20th century. But it was replaced by the more accurate North American Vertical Datum of 1988 because of its importance in floodplain management. One of the main reasons for the change to NAVD88 was because the National Geodetic Survey (NGS) found that the sea was actually not level at all. There were local variations caused by wind, currents and topography of the sea bed. The numbers didn’t fit because mean sea level was higher at one locations compared to elsewhere. Eventually, satellite technology found that these distortions were being caused by gravity. The North American Vertical Datum of 1988 (NAVD 88) is based on an adjustment of leveling observations from across the country. A highly accurate surveying technique called geodetic leveling was used to measure height differences across the country. The 1988 vertical datum was based on over 600,000 kilometers of control leveling. It also used satellite technology to improve on earlier vertical datums. The tools for accurate elevation measurement have also remained fairly consistent over the years with the use of level rods and a sighting instrument to measure the height differences between two points. Today a laser may replace the use a telescope but the approach remains the same. Eventually, satellites such as GRACE, GOCE paired with GPS technology found that these distortions were being caused by gravity. These satellite systems account for differences in gravitational forces in different areas. How likely is your home of flooding? This is what organizations like Federal Emergency Management Agency (FEMA) are responsible for. If we say that flood waters will rise 25 feet, what exactly is “25 feet” referenced to? We need a consistent starting point to compare flood and ground elevations. This is why consistent vertical datums and mean sea level are so important. Effective floodplain management depends on accurate surveying. During a new construction, FEMA measures proposed structure elevations. They compare base flood elevations to ensure that new construction will be reasonably safe from flooding. What’s important is that all survey points must use the same vertical datum throughout the survey. 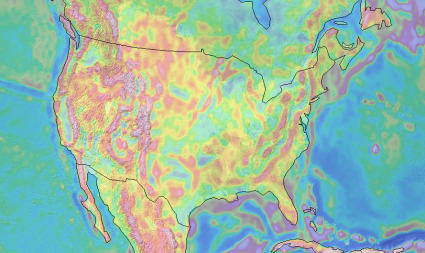 Differences in vertical datums can range from three feet or more in the Rocky mountains where gravitational forces are high… to a couple of inches in other areas. NAVD88 corrects many of the problems with NGVD29. The 1988 vertical datum was based on over 600,000 kilometers of control leveling performed since 1929 and reflects geological crustal movements or subsidence that may have changed benchmark elevation. If you were to perform surveys for floodplain mapping, up until recently most flood insurance maps used NGVD29. However, FEMA has made the switch to NAVD88. What’s important is that when conducting a survey, all measurements must use the same vertical datum throughout the survey. 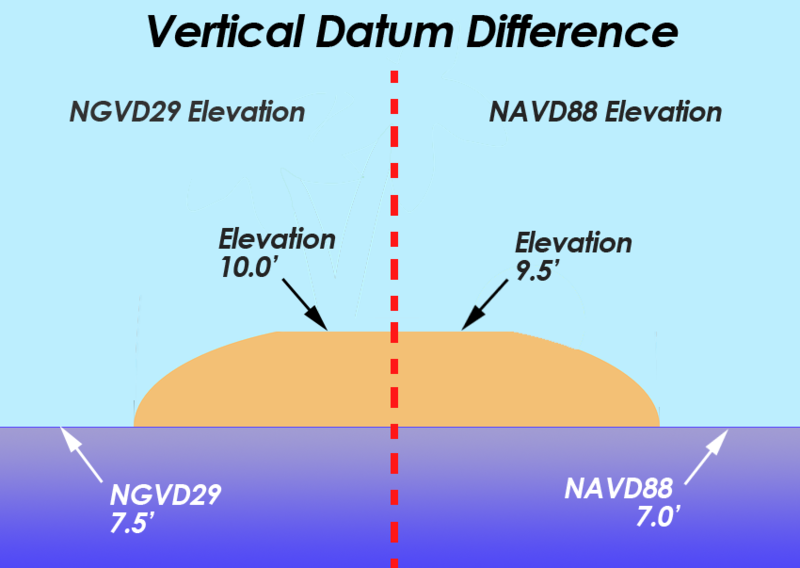 Differences between NAVD29 and NAVD88 can range from three feet or more in the Rocky mountains where gravitational forces are high… to a couple of inches in other areas. A vertical coordinate transformation isn’t a simple plug-in-play formula. These transformations require software to transform to different vertical datums. The NAVD88 is a correction of thousands of control points of elevation datum. VDatum is a free tool by NOAA to transform data among a variety of tidal, orthometric and ellipsoidal vertical datums. Users can convert their data from different horizontal/vertical references into a common and desired reference level. A horizontal coordinate system gives us the side-by-side that is our latitude and longitude. A vertical datum is another component of your typical horizontal coordinate system. Most vertical datums in North America use sea level as the basic reference plane from which we measure elevation changes. 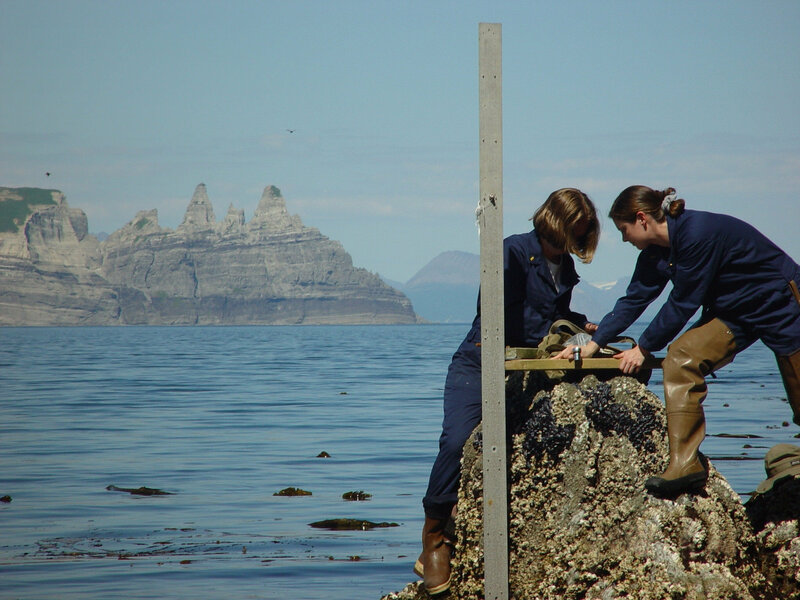 With mean sea level (MSL) as a reference point of zero, it is possible to measure height or topography accurately. We can also begin to understand if ocean levels are rising or falling over time. We are on a three-dimensional planet which has ups-and-downs in addition to the side-to-side in a horizontal coordinate system on the surface. To handle the ups-and-downs, we have the vertical datum which gives a place to put the zero measurement with mean sea level as the basis for our ups-and-downs. This is called the geoid. GIS Technicians: What to Expect in an Entry-Level GIS Technician Job? Aspect Maps: How Do You Find Out the Aspect of a Slope? In the mountains, the terrain slopes are in all directions – east, west, north and south-facing. The compass direction that the slope faces is slope aspect. Topographic profiles are cross-sectional views showing elevation along a line with applications in engineering, hydrology, land use planning and more.